Kate Heegaard Hartfiel was born in Minneapolis Minnesota and received her BA from Skidmore College in Saratoga Springs, New York. Her studio is located in the Casket Arts Building in the Northeast Arts District in Minneapolis. Each painting is a new artistic journey. I strive to create a sense of balance and movement with each composition. 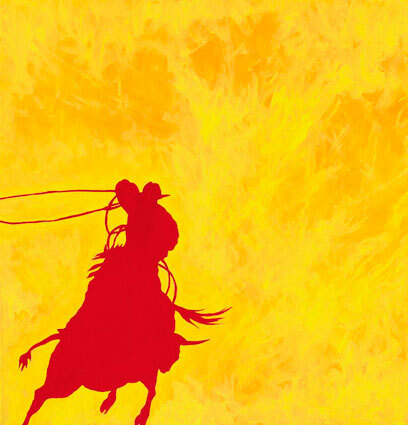 There is an innate interplay between the organic flow of color and light and the straightforward and iconic image of the American cowboy. A variety of experiences inspired this current body of work. A childhood spent on the back of a spirited pony and a gentle mare defined my youth that was filled with independence and freedom. Summers spent riding and climbing the rocky mountains fostered a love affair with the West that has not yet lost it's passion. Family car trips across the Great Plains gave me an appreciation, (If not romantic notion) about the “Big Sky Country” and the people who still work the ranch lands today.